For those who have gotten used to utilizing Spaces since it’s initial release in OS X Leopard 10.5, don’t panic when you boot up Lion for the first time. Spaces is now integrated into the new Mission Control, along with Expose, and has been rebranded with a more idiot-proof name: Desktops. Mission Control is the new one-stop-shop to access any open applications and widgets. It also is where you now control Spaces, aka Desktops. Here you can create as many desktops as you want (up to a maximum of 18), and gives you the ability to organize your windows based on applications, or by the type of work you’ll be performing in each Space. For example, you could keep your web design coding applications in one Desktop, and have your graphic design software in another, and your email in another, etc. So now that we know the basics, lets look at how this thing works. 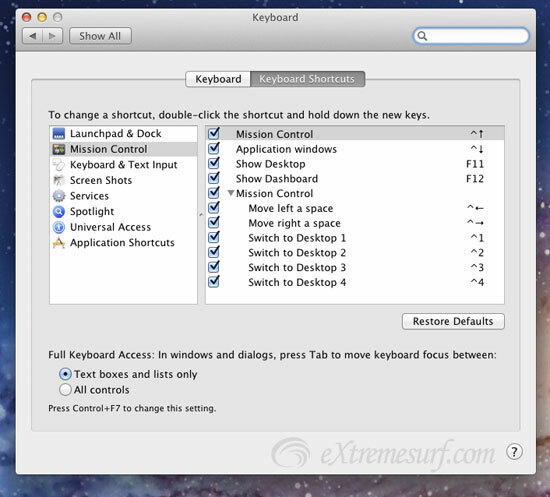 The third way to create a new Desktop space is by dragging and dropping a currently-open window from the Mission Control section to the top left or right corner until the Desktop icon appears. This automatically creates a new Desktop and moves this application to it. Are you referring to the X not appearing to close additional desktops in Mission Control? 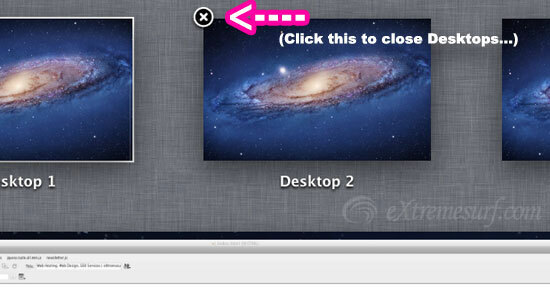 You need to leave your mouse hovering over the desktop you want to close for 3-5 seconds before the X will appear.. This is driving me CRAZY!!! What you call “Assigning Windows to Specific Desktops” is actually not that at all. It is assigning specific APPLICATIONS to specific desktops. But if you want to have one browser window attached to one Desktop, and another browser window attached to another Desktop… NO CAN DO! As soon as you reboot or relaunch the app, you lose that and everything goes to the ONE desktop the app was locked to. I’d sure love to be wrong about this… and from my my research, so would a LOT of other people! First of all, you can attach a browser to ‘All Desktops’. 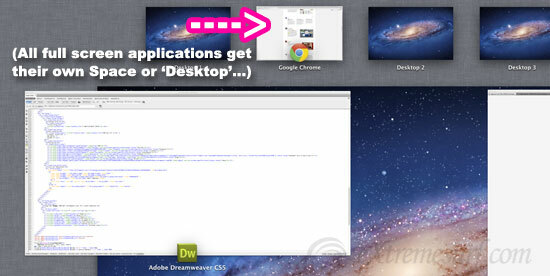 If that doesn’t work for you, you can open and drag Windows to each individual desktop. If I’m understanding your problem, you don’t want to physically see other tabs/windows of a specific browser (ie Firefox) in another Desktop, you want a completely separate copy of that browser running in the other desktop? Why not assign a different browser to each desktop? Or is your work browser-specific? You need to understand that the system is using the same application files in each Desktop, not a completely separate install or virtual machine. It sounds like what you want to do is have each specific Desktop run as a virtual machine.. Appreciate the suggestions, but All Desktops doesn’t at all accomplish the goal. Unfortunately if you place a window in a specific desktop, and have the application itself assigned to another desktop, as soon as you quit the app or reboot (which of course quits the app), you lose all your other windows settings, and everything falls back onto the main application’s Desktop when you come back again. What I want seems like such a basic obvious thing. I want different windows of specific applications, assigned to specific Desktops, such that they will STAY THERE unless I move them somewhere else. I even went so far as to use a shell script to fire up a second instance of FireFox, and thought I was home free. Nope – turns out that all instances of an application inherit each other’s Desktop assignment. So assign one instance to Desktop 4, and the other instance to Desktop 6, the first one switches to Desktop 6 as well. I haven’t even found a third party utility that can accomplish this, but no shortage of people screaming for it. When you right-click on an application, many actually have three options: All Desktops, This Desktop, and None. If you choose “None”, you should be able to then drag individual windows of the same application to whichever desktop you please. I have the same problem. I know I can move the new desktop window to another space, but I just don’t want to. I have not assigned any applications to any desktop, because as someone else mentioned (don’t remember if it was here or another website), I don’t work with and application mindset, but with a project mindset. So let’s say I open safari and excel to work on my budget on space 1. Now, I’m not done with this, so I leave it opened. So I go to another space, and need to open safari and excel to work on my school project. When I open a new excel window, it will automatically open it in space 1, because there is already an Excel window there. Fine, I can move the new window to space 2, I know. But I didn’t want it to open in space 1 in the first place. There is no way to stop that. I know it seems like I’m being lazy here, but when I work on a gazillion projects at the same time, it gets complicated. It’s like an added feature that no one wanted. I had no problem with spaces on my macbook black. I totally agree, this feature is driving me completely whacko! I’m an experienced developer and all I want is a simple space where I can move my windows to whatever desktop I like and group them according to content, rather than application. The other problem that happens is that when I move an application to a desktop and it’s on a second screen, it gets assigned to my primary screen and then is impossible to move back to the second screen. Can someone please explain the thinking behind this feature to me? What sort of workflow would make this desirable? My blog is in the exact same niche as yours and my visitors would really benefit from some of the information you provide here. Please let me know if this alright with you. As long as you give credit and a link back to our website or post as the source, sure no problem! After began to read i didn’t think that it can be important info for me but right now I am surely greatful that I noticed this spot to read. Regards to the author. I fully agree: Assigning applications, not individual windows, to desktops is useless and IMHO plain stupid! Is the “solution” really to have different browsers?!?!?! One per task?! Stupid, just stupid. Is there any possibility to have certain apps on directly on certain desktops? What I mean is can i have a desktop where on it i can have my games and on another desktop where either i don’t see them or have other completely different apps on it? If not can I at least have different docks on different desktops?